HAMPSTEAD, Ont. 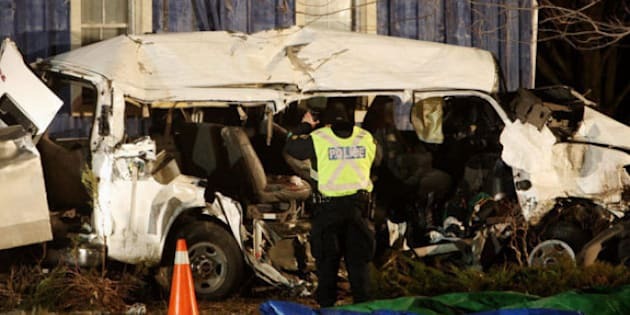 - Eleven people were killed Monday in a horrific collision in rural southwestern Ontario that saw a flatbed truck broadside a large passenger van, sending it hurtling across a lawn before smashing into the side of a house. The area was littered with debris, from the intersection where the collision occurred, to the surrounding road, and roughly 100 metres across the lawn to where the wreckage of both vehicles lay Monday night. The bodies were laid out under a sea of green and blue tarp in front of what remained of the van. A large white van loaded with people believed to be migrant workers was travelling west when it was broadsided by the flatbed, said OPP Insp. Steve Porter. Ten of the passengers in the van were pronounced dead at the scene, he said, adding the driver of the truck was also killed. Collision reconstruction experts were on the scene picking through the twisted metal with flashlights in hand well into the night. The driver's side of the van rested up against the side of a blue house, its passenger side ripped nearly clean off. The truck lay at about a 45-degree angle on the ground, with the cab twisted upside down. Police said one survivor from the van was airlifted to hospital in Hamilton with life-threatening injuries, while two others were being treated for serious injuries in nearby Stratford, Ont. "I've been on the job for 28 years and I've never seen anything quite like this collision tonight with 11 people killed in one crash," Porter told a news conference at the scene of the crash. The crash occurred at 4:45 p.m. ET at the corner of Perth Road 107 and Line 47. Police said the weather was good at the time. The CEO of Speedy Transport released a statement saying one of its truck drivers was the one killed in the crash, though he did not release the driver's name. Jared Martin said he was told by provincial police that the van failed to stop at the stop sign and was hit by the Speedy Transport vehicle. The transport driver tried to swerve but couldn't avoid the van, Martin said. "Our thoughts and prayers are with our driver's family and the families of the other victims involved in this horrible tragedy," he said. Porter said police believe many of the victims to be migrant workers, but offered no other details. Some reports said one of the survivors spoke Spanish. OPP Sgt. David Rektor said the workers were travelling in a van equipped to carry 15 passengers safely. He said investigators believe driver error was behind the crash, but offered no other details. Porter said firefighters had to cut off several seat belts to free the victims. Because of the severity of the crash, Porter said incidents counsellors have been called in to provide support to investigators and community members. The crash drew a statement of sympathy from Premier Dalton McGuinty. "On behalf of 13 million Ontarians, I want to offer our deepest condolences to those who lost a loved one and to offer our most sincere prayers for those taken to hospital," McGuinty said, adding thanks to emergency workers and investigators on the scene. The United Food and Commercial Workers Union also offered its condolences to the families of the victims and called for an thorough probe into the cause of the crash. "The safe transportation of agriculture workers has always been a critical issue, and we must expect a relentless investigation into how and why such a tragedy occurred," said UFCW president Wayne Hanley in a statement. The UFCW noted that more than 20,000 migrants work in the Ontario agriculture sector each season. Monday's tragedy is the deadliest multivehicle crash in Ontario since 1999, when dense fog near the southwestern city of Windsor caused an 87-car pileup that claimed eight lives. Canada's worst road accident took place in Quebec in October 1997. A chartered bus taking a group of senior citizens on a tour plunged over a 20-metre embankment near the town of St-Joseph-de-la-Rive, killing 43 of the 48 people on board. _ With files from Michelle McQuigge in Toronto.